Hunting for big cat style? 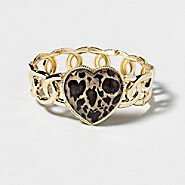 You’ve found it in this easy to wear Leopard bracelet. A natural with animal prints, it’ll easily blend into casual or formal looks.